The Epiphany Lower School fosters a warm, caring, stimulating environment. Kindness and respect for others are core values of the school. In this supportive atmosphere, our students are encouraged to collaborate and help one another. Classes in the lower grades are self-contained. Teachers strive to develop a nurturing, productive environment in each classroom, always respectful of each child’s needs and learning styles. With teachers as guides, Lower School students establish the social and academic skills that will support their learning and growth throughout a lifetime of education. The Epiphany School follows the New York State Learning Standards and Core Curriculum for all grades as well as the Archdiocese of New York standards. Our teachers and administration use these standards to develop a curriculum that meets the needs of our students. Natural curiosity and self directed learning are encouraged. Individualized instruction helps each student realize his/her potential. The Religious Studies Program is the cornerstone of the school’s curriculum. 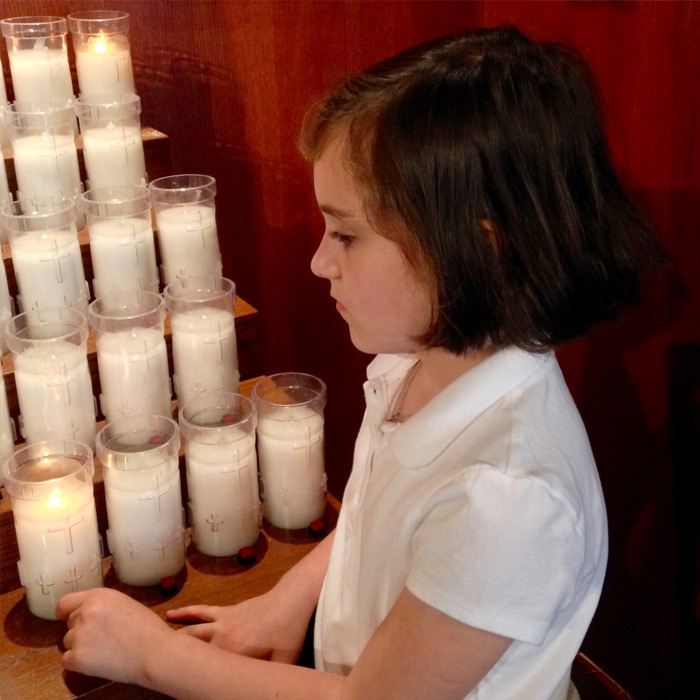 Students in the Lower School receive regular instruction in Religion that focuses on the principles and doctrine upon which the Catholic faith is founded, and the integration of these principles and doctrine in our daily lives. It focuses on exploring and deepening the student’s relationship with Christ, His Church, and His message. They are taught doctrine, experience liturgy and the sacraments, discuss morality, and deepen their prayer life. This teaching promotes active learning that translates into active faith. Students in Kindergarten and Grades 1 and 2 participate in the Atrium Program, a Montessori based hands-on Religion curriculum. The English Language Arts Program incorporates a basic reading program, good literature, and direct skill instruction with opportunities for growth in oral and written expression. Reading instruction is designed to produce life-long readers. Students are required to discuss the literature at hand, which in turn enables skill building in speaking, writing and critical thinking. They learn to appreciate themselves and their classmates as they experience similarities and observe differences. The Mathematics Program in the lower grades emphasizes instruction in computation as well as mathematical concepts. Students learn to communicate and reason logically, and they become independent problem solvers. The use of manipulatives across the program allows students to work with concrete problems, encouraging them to apply math skills in other curriculum areas and to recognize the value and use of these skills in their daily lives. Learning to respect and appreciate one’s self, one’s family and one’s community is the driving force behind the Social Studies Program. Students explore the world in which they live geographically and historically. They make comparisons, explore causes and effects, study historical figures, and begin to realize the importance of involvement in their community. The Science Program offers another venue for exploring the world. A hands-on constructivist approach engages students and allows for independent discovery and learning. Environmental awareness is also an integral part of the program. Field Trips are planned that complement and enhance the Science curriculum. Students in Kindergarten – Grade 3 also receive weekly instruction in Art, Gym, Library, and Music. Spanish is introduced in 1st grade with stories, lessons in culture, and beginning vocabulary. Our state-of-the-art Digital Learning resources provides teachers and students with the tools for applying technology on various levels throughout the academic day. There is a RealTouch Display in every Lower School classroom which allows our teachers to incorporate all types of media into their lessons. Use of the Internet’s vast wealth of information is continually integrated into lesson plans as a rich source of supplemental knowledge and learning. In Kindergarten and 1st Grade there are 1:2 iPads in the classroom and in 2nd and 3rd Grades there are 1:1 iPads in the classroom. iPads and iPad Apps are integrated into lessons where and when the use of the technology will enhance the learning of the objectives. Our Lower School classes use their iPads to attain increased engagement and differentiated instruction. Rather than eliminating other teaching tools such as textbooks, technology has expanded the menu teachers can choose from, enabling different forms of collaboration in the classroom and beyond, and motivating students in new ways. Homework is assigned nightly in Grades 1–3. Students are responsible for their own assignments. Each teacher explains homework expectations during the Class Meetings in September. Weather permitting, all students have recess outdoors every school day. Kindergarten and students in Grades 1-3 should arrive 8:25 a.m. – 8:35 a.m. at the Lower School campus. There is a free Early Drop-Off program that starts at 8:00 a.m. in the Lower School cafeteria, breakfast is available. Teachers will not dismiss any student to anyone other than his or her parents, or authorized guardian, without prior written consent of at least one of the parents.